Cozy Chicks: Think. Don't yank. And so we had a bit of toaster mishap yesterday. I have an elderly toaster. I don't consider a 58 old for a person, but let's face it, it's old for a toaster. I bought my toaster at a yard sale in West LA more than 30 years ago and it has been a trusted friend ever since. How do I know the toaster is 58 years old? Because the first owner wrote the date they bought it on the bottom. It's a Sunbeam, and isn't it a beauty? Of course, like the rest of us--it's had its little problems. The cord has been replaced, and the plug has been replaced more than once. In fact, the current plug is REALLY snug in the wall socket. It takes quiet a bit of tugging to get it out. Okay, so yesterday I was in a hurry. The last slice of bread in the bag was a little bent, but what the heck--I put it in the first slot. You'll notice there's no little lever. Nope, my Sunbeam has a little thingy INSIDE the toaster that senses bread and gently takes it down into the depths to bask in the heat of the glowing elements. 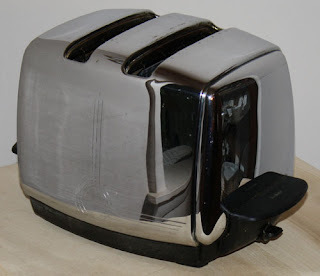 After 58 years, my toaster is a little temperamental. You kinda have to watch it. But I was nuking my egg,and kind of forgot. 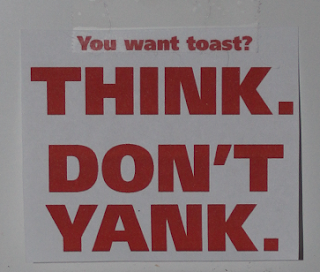 Next thing I know, the kitchen is filling with smoke from my charred toast. The bent corner of bread was kind of touching one of the heating elements. So, panicking, I yanked the plug. Only ... the plug stayed in the socked, and I only held the cord in my hand. I was out most of the day and came home to find this sign over the wall socket. What hoops do you have to jump through to get toast? Tell Mr. L thanks for the chuckle! I needed it. Things happen! I have the hand mixer from my first marriage in 1966. Even though the cord is taped, I still use it. It works better than the new models! I'm in the process of remodeling a 60 year old house. There is only one kitchen circuit so I can't microwave and toast at the same time. Shades of Green Acres. When I first moved in the laundry was on the same circuit so I had to wait for the washer to shut off before doing anything in the kitchen...but we're making progress.